One of my earliest memories as a child was being on a road trip with my dad, mom and brothers. We were in a large strange urban city, it was very late at night and for some reason my parents had not made hotel reservations. Exhausted and cramped up from driving all day, we went from hotel to hotel trying to find a safe place to rest for the night. 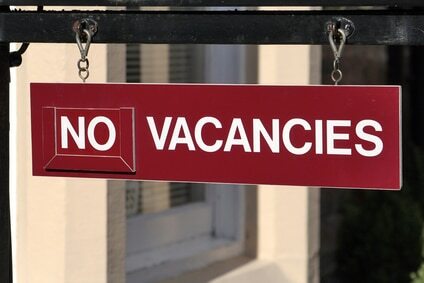 Many hotels had their ‘No Vacancy’ sign lit up but for the ones that didn’t the routine was the same. We would all wait in the car as my mother would go into the hotel office to see if there were any rooms available. One after another, she would get back into the car and the verdict was always the same–no vacancies. This went on for what seemed like hours until finally with great jubilation we found a place that had room for us. (This may be the very reason I never travel without a plan!) Although the specifics of this event, when it was or where we were, are pretty vague, the feelings I felt are unforgettable. I felt afraid, unsafe, insecure and even a little rejected. If you multiply my experience by a full term pregnant woman with possibly a donkey for transportation, we probably couldn’t even begin to imagine what that would have felt like. With all the other challenges that Joseph and Mary encountered, why didn’t someone show this weary tired couple some hospitality? We have all seen the Christmas plays where the inn keeper is the inhospitable preoccupied host managing a full house because of the census. But actually there are many scholars, who believe that Joseph and Mary were rejected by family rather than an inn keeper. They base this on the fact that the word translated “inn” in Luke chapter 2–Kataluma can also be translated “guest room”. And that the Greek language has a word for hotel or inn and if Luke meant that he would have used it as he did in Luke chapter 10, when he wrote about the Good Samaritan who took the beaten man to the “inn”–pandocheion, and paid the “innkeeper”–pandochei to care for the man. These scholars contend that Joseph was going back to his hometown where he undoubtedly would have had relatives that could have put them up. But for whatever reasons, they did not. They may have been full with other relatives because of the census or they may have denied them any hospitality because Joseph’s betrothed was scandalously pregnant. Sometimes family can be the most hurtful. However it came about, it was a terrible tragedy. Our verse says Mary gave birth, Mary wrapped him in cloth and Mary laid Him in a manger. All of this she did by herself! She was alone at a time when a woman should be cared for compassionately. Why did no one send for a midwife? What kind of people would refuse to extend a generous hand to those so obviously in need? Unfortunately, most of us have done this! How many times have we looked the other way when neediness looked us straight in the eye. If you were like me, you probably had many reasons why you couldn’t extend a hand of hospitality to a stranger. Maybe you weren’t sure if the need was legitimate or it would have been awkward. Maybe it was inconvenient or you just didn’t want to expend the time or money. Maybe you wanted to just spend time with your family or you were just afraid since you didn’t really know them. Do these reasons excuse us from helping those God calls us to help? The Bible is clear, there are times when we must be obedient and trust God when He leads us to help those in need. For some it may not come naturally, but we are called to do it just the same. At my mothers memorial service in January, I shared about her gift of hospitality but even for her there were times her obedience in this area was a step of faith. The following is an excerpt from her Eulogy. She was a woman with the gift of hospitality. Some of my fondest memories are of her inviting others to our house for dinner. When my father was stationed in North Dakota, she would invite all the single airmen from our church, who had no nearby family to our home for Thanksgiving. One event that is still very vivid in my mind was when a strange couple showed up at our church and needed a place to stay. My mom invited them to come stay at our home for as long as they needed. I have to stop here and put this into perspective for you. My mom was the type of mother and grandmother that was always calling you up to tell you about food and baby equipment recalls, kidnappings, escaped convicts, and murderers on the loose. She once even conducted a one-on-two seminar with my daughters, Annie and Katie on how to get away from a mugger and what to do if they were kidnapped and put in a trunk of a car. For her to invite this couple that we knew nothing about to stay in our home for a few weeks was unusual. But she said she believed God told her to do it. We never heard from the couple again and she always maintained we had entertained Angels unaware. According to 1 Timothy 5:4-8 who should take care of family? Why do you think the Apostle Paul uses such strong language? According to James 2, what is the connection between caring for others and our faith? Who is it easier to be hospitable to . . . family or strangers? Have you ever experienced an exception? According to todays reading, who is supposed to practice hospitality? Why do you think it is a qualification for leaders to be hospitable? Who should our leaders be emulating? Have you ever been around a leader that was not hospitable? How did that make you feel? According to these scriptures, to whom should we be showing hospitality? If you don’t have the ‘gift’ of hospitality are you required to be hospitable? Why does Peter say to offer hospitality without grumbling? Why do you think scripture says ‘practice’ hospitality? What can you do this week to practice hospitality? According to these scriptures, to whom are we supposed to do good. Why do you think this passage says not to forget. Think of a time when you showed hospitality to a stranger. Was it a good experience? What 6 actions do you see emphasized in these scriptures? Have you ever been a recipient of someones goodness in any of these areas? What was the difference between the sheep and the goats? According to this passage, who are we really helping when we help those in need?